Hiya everyone, Welcome back to my blog! I am sharing my second card using Simon Says stamp May card kit. 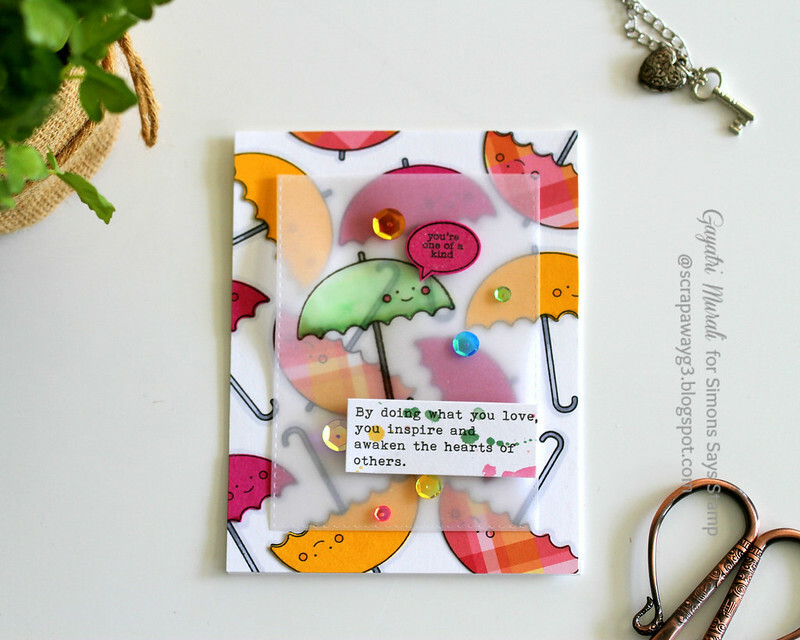 I started with stamping the umbrellas randomly on the card front using Simon Says Stamp Intense Black Ink. I then stamped the umbrella on one of the pattern paper from the kit and also on the Sunshine and Doll Pink cardstock. I had cut them out with scissors. Then adhered on the stamped umbrella image on the card front. I coloured the handles with copic cool grey markers. This made a colourful background. Love it. For the focal point, I die cut a vellum cardtock using one of stitched rectangle die from Simon Says Stamp Stitched rectangle die set. I black heat embossed the umbrella on the vellum panel. Coloured the umbrella green using Zig clean brush pen. I then stamped the speech bubble from the stamp set on Doll Pink cardstock with the sentiment inside. Hand cut out and added to the focal panel. The secondary sentiment is from Pinkfresh Studio stickers also from the card kit. Finally embellished with sequins from the card kit. I adhered this panel to the card front using foam hidden behind the sticked and speech bubble. I brushed the speech bubble with clear shimmer using Wink of Stella. Hope you like my card. 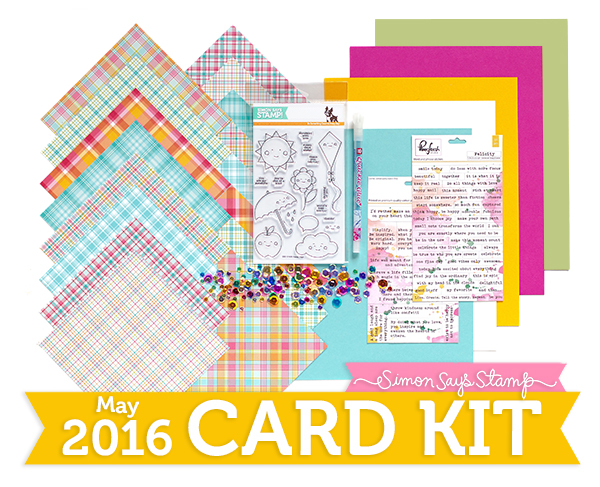 You can find more inspirations using the card kit in the gallery here! Love the card, the colors are amazing. All of your cards look like works of art, I just love seeing them! What a super colourful cheerful card! Love it, especially the vellum on top. Its a great idea to stamp on designer paper to fill in your stamps too. I'll use that in the future! Thanks for sharing.